Tired of discussing the subtitle character of Captain America: The Winter Soldier? No problem. Because there’s a new superhero in this Captain America sequel and he’s definitely worth talking about instead. As you can see, Falcon’s gone through a few color scheme changes since the 60’s. Sam Wilson, a.k.a. 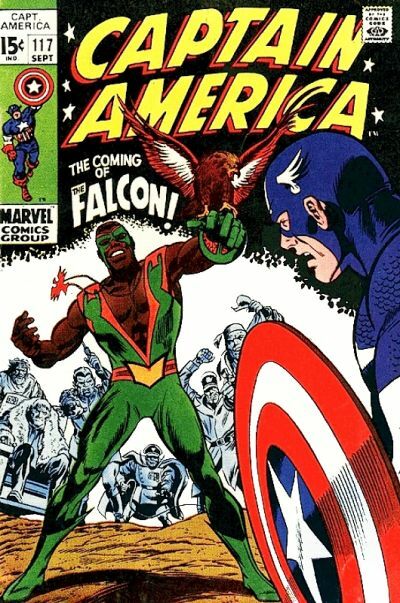 the Falcon, first appeared in Captain America #117 (1969). He was the product of the creative duo Stan Lee and Gene Colan. He preceded the first appearances of Marvel’s Luke Cage and Ororo Monroe by roughly three and six years respectively. He was the first African-American superhero character. (Black Panther is a Wakandan prince.) He is also the first superhero of color to not have “Black” as a part of his superhero name. Sam’s had quite a few backstories. They have included him being an inner city social worker of New York, a former thug (his gangster persona is known as “Snap” Wilson), or just an average resident of Harlem who really likes birds. The Cosmic Cube/Tesseract is often involved in ret-conning or revealing which backstory the current writer wants Sam to have. The Falcon does in fact have a falcon. Something we probably will not see in Winter Soldier is his empathetic link with Redwing, his sidekick falcon. Depending on which version one reads, his link with birds has been the result of everything from Cosmic Cube tampering by the Red Skull to burgeoning mutant powers. The concept of the Falcon, as played by Anthony Mackie, appears to be most similar to the one in Marvel’s Ultimate line of comics. The Ultimate Universe’s Falcon has a background that involves vaguely military training, connections to Fury’s super-spy types, much more high-tech wings, and much less color in his uniform. Sam comes in at #96 on IGN’s Top 100 Superheroes. They crack a joke about his ability to talk to birds but he gets kudos for being on par with Cap. Sam became Captain America’s new partner after Bucky had died. In the 1970s especially, he and Cap were considered so much a team that he received second billing in the series title itself: Captain America and the Falcon (Feb. 1971 – June 1978). In a storyline in 2004 – 2005 that series title was briefly revived. 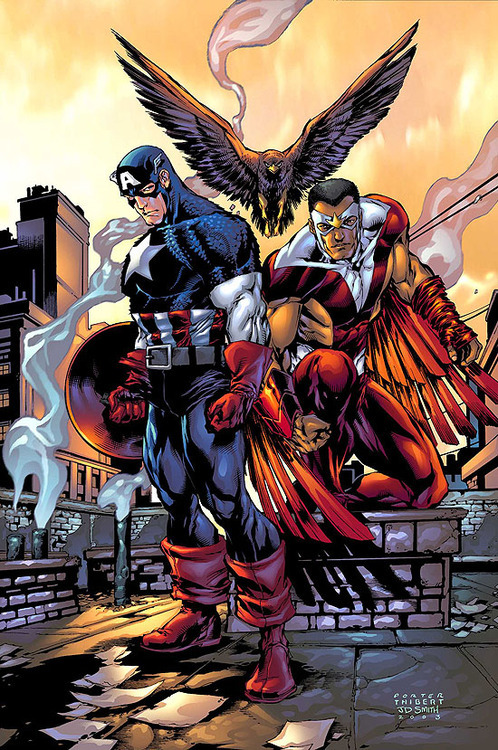 Cap and Falcon circa their series in the early 2000s. In the late 1970s, Falcon joined the Avengers–for the first time. But since he was nominated because he was one of the only active African-American heroes, he quit soon after in protest his rather token status. He has since joined the Avengers a few more times, and will once more be a part of the current roster in the Marvel NOW! initiative. Bucky wasn’t the only one to carry Cap’s shield: Sam took on the Cap persona for a very short time when Steve was thought dead (Captain America: Sentinel of Liberty #8-9, 1999). The Falcon is actually no stranger to the screen–if you count animated appearances. While Captain America: The Winter Soldier will be the character’s first live action appearance, Sam has appeared in four separate animated television series: The Avengers: United They Stand (’99 – ’00), The Super Hero Squad Show (‘09- ‘11), The Avengers: Earth’s Mightiest Heroes (’10 – ’13), and Avengers Assemble (‘13 – ‘14). In the latter show, he is considered one of the show’s protagonists, and displays technical savvy much like that of Tony Stark.